4/13 Cup of Coffee: Greenville powered its way to the only win in the system on Thursday night. The Drive conquered Rome with a 17-hit outburst led by three-hit performances from Everlouis Lozada and Pedro Castellanos as well as the continued hot start of shortstop CJ Chatham. Pawtucket made a late shuffle when its scheduled starter ended up the first man out of the bullpen to relieve Rick Porcello in Boston, while Salem saw a four-game winning streak come to a close. This game was interesting several hours before the first pitch, when scheduled starters Marcus Walden and Chad Bell (DET) were called up to their respective major league squads. Justin Haley was pressed into service for Pawtucket, allowing three runs on seven hits in five innings. Josh Smith struck out four in his two shutout innings of work, and Roenis Elias surrendered a solo homer in the eighth. The day after breaking out of an 0-for-14 streak to start the season, Josh Barfield hit his first homer of the season. Ramon Flores hit a two-run blast that brought the PawSox within one in their ninth-inning rally. Rusney Castillo stole a base as part of his three-hit evening. Salem's win streak came to an end at four games as the Astros handed the Sox their second loss of the young season. Jake Thompson was uneven in his second start, allowing six runs (three earned) on four hits in five innings. Jordan Weems was outstanding in relief, striking out three and walking one in three hitless innings. The Drive opened with a seven-run first inning and did not let off the gas in a 17-hit barrage. Marino Campana and Isaias Lucena blasted homers in the first to key the Drive. Everlouis Lozada has responded well to an aggressive placement in Greenville after spending almost the entire 2017 campaign in the Gulf Coast League. Lozada was 3 for 4 with a double and three RBI. He is off to an 11-for-30 start. Pedro Castellanos added three hits, and a 2-for-4 night from CJ Chatham brings his early season line to .440/.464/.560. Michael Osinski joined the hit parade, driving in four runs with a single and double. Starter Denyi Reyes was the beneficiary of the offensive outburst. Reyes allowed three runs (two earned) on six hits in 5 2/3 innings, striking out four without walking a batter. 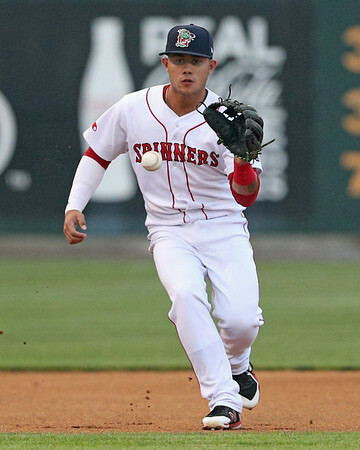 Player of the Day: Following a solid stateside debut, 5-foot-7 third baseman Everlouis Lozada essentially was skipped over Short Season-A Ball to earn a spot with the Greenville Drive. Far from overwhelmed, Lozada has been outstanding in the early going. After a season-opening six-game hit streak came to a close on Wednesday, he responded Thursday with a 3-for-4 effort that included a double, three RBI, a pair of runs scored, and a stolen base.